Lots of good things happened this year - however I also spent a good three months suffering from concussion so we will skip that part. I will keep things in chronological order. First up was the exciting news of having my work stocked at the Sainsbury Centre for Visual Arts. I grew up not far from the University of East Anglia (SCVA is on the UEA campus) so this building, along with the iconic ziggurats and brutalist architecture of the concrete campus has always held a special place in my heart. I am thrilled to have my work stocked at SCVA and will never tire of popping in and seeing my work living under the same roof as some of the worlds best art, and artifacts. 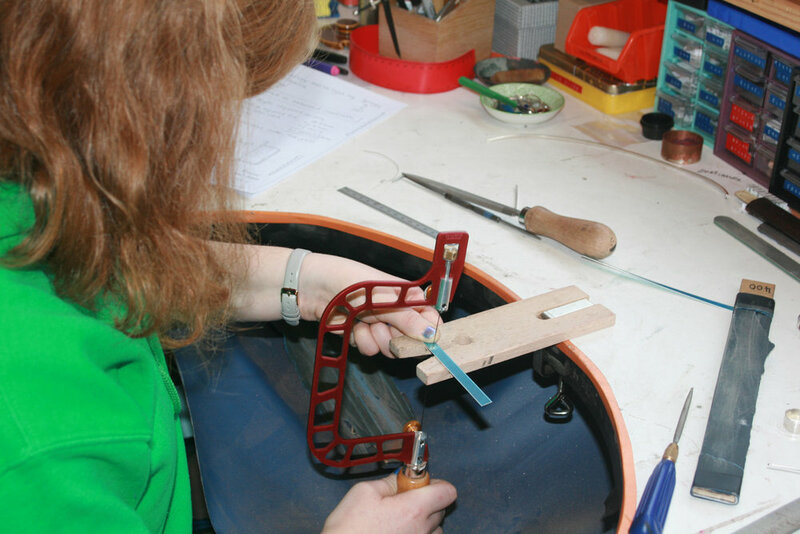 Another mention has to go to my private jewellery lessons which take part in my studio, details here. 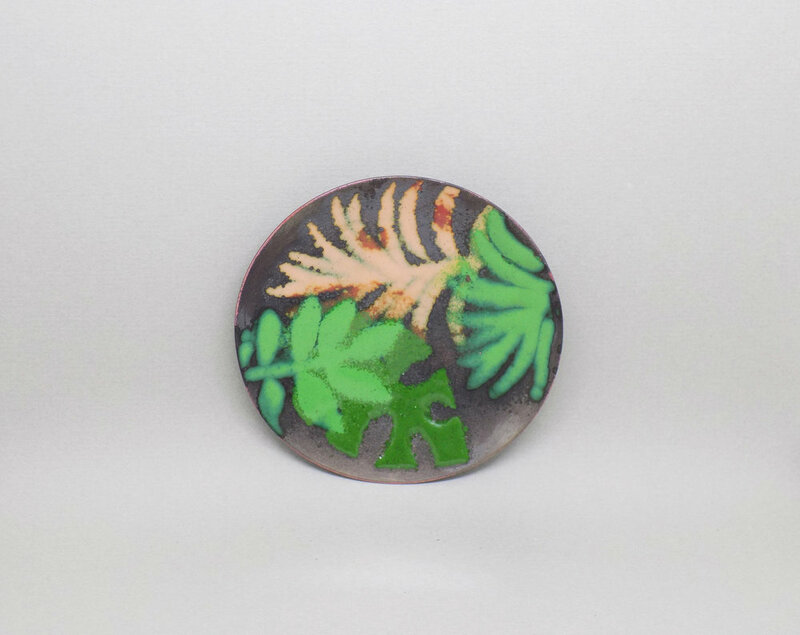 These have been very popular and I love seeing the final piece of jewellery each person makes, but more importantly I love helping people to achieve something that just a few hours ago they didn’t think they could. They leave beaming with pride in what they have accomplished. 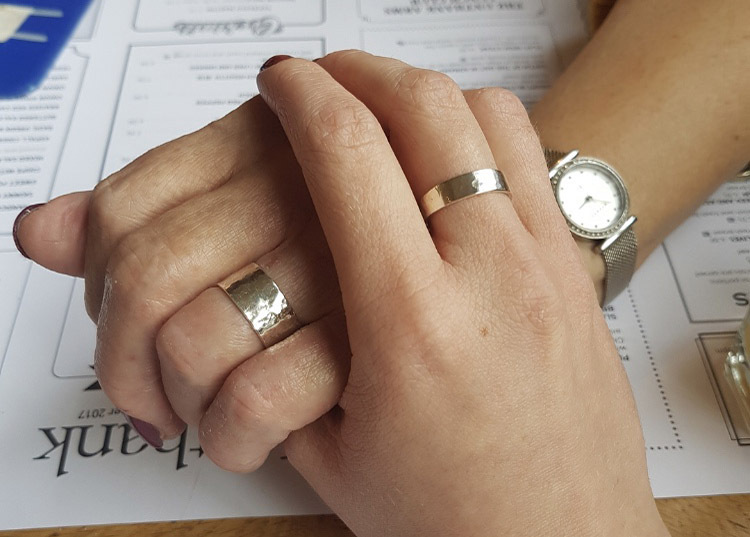 Over the next month I will be amending the sessions I currently offer to incorporate some new lessons, including earrings, bangles, spinner rings, stacking rings, and enameling… get in touch if you would like info before its available online. Of course I can’t mention 2018 without mentioning my copper enamel bowls - you lot can’t get enough of them! Which is great because I love making them, and have enjoyed experimenting with the designs a bit more. 2018 saw the Plant Collection come to fruition, sitting alongside the Cloud Collection, and the Kingfisher and Gold Collection from 2017 (National Trust and Crafts Councils Competition Finalists, dontchaknow?!). 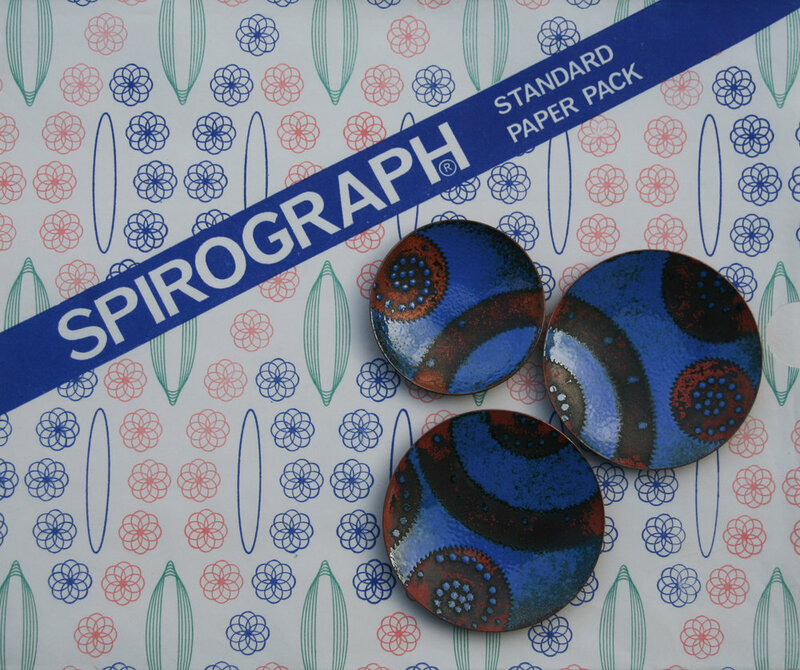 You also got a sneak peak at the Brutalist Collection which will make an official appearance this year, along with the Spirograph Collection, and a few more are up my sleeve so keep your eyes peeled! In the summer I said goodbye to the Fat Bottomed Girl rocking whisky tumbler as it headed off to a new home. I’m looking forward to making some more this year. 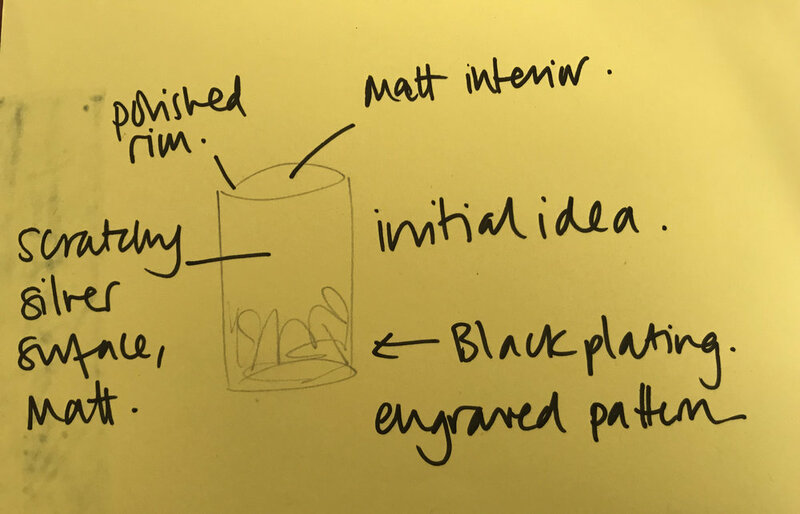 During the summer I was also fortunate enough to be contacted by the Goldsmiths Centre and asked to submit a design for a Gin Tasting Beaker - more details here. I was incredibly excited to be given the opportunity to create my design, and happy to say that beaker also sold and is now being enjoyed by its new owners. Sadly I forgot to give it a trial run before sending it off, so I can only imagine how enjoyable it is to drink from! It was a good summer - I was also lucky enough to be selected to attend a Contemporary British Silversmiths Graduate Training Course, at Goldsmtihs Centre, along with Helena Russell, Callum Partridge, Alex O’Connor, Emma-Jane Rule and Jessica Jue under the watchful eyes of Abigail Brown and Rauni Higson. It was billed as a raising course but the week saw us learn so much more than that, so many helpful tips which will really benefit my practice going forward. It was a long hard week but so good - can we do it again this year please?! 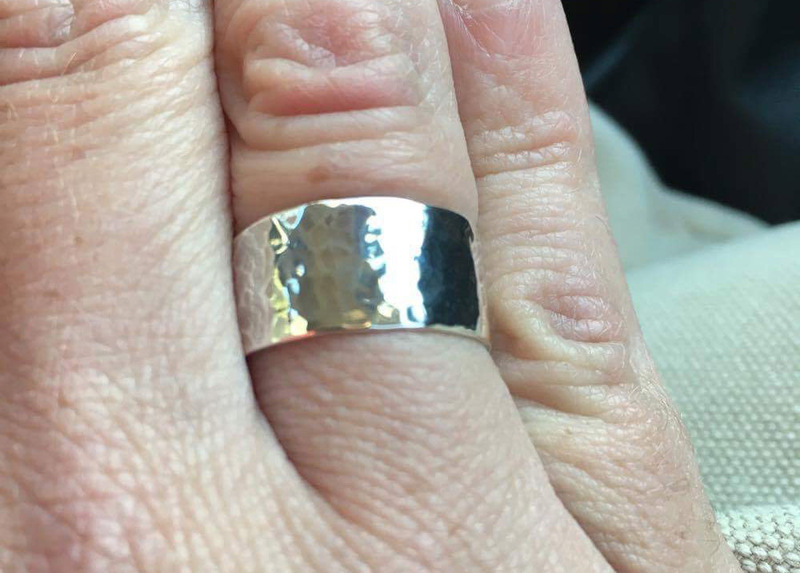 The end of the year brought some excellent news; I was offered a Silversmithing and Jewellery Tutor job at Wensum Lodge, teaching adult education classes. Particularly brilliant as these classes are where I first started, over a decade ago, and had I not taken that first step I would never have found something that I fell in love with so much I’ve made it my career. To cap the year off nicely I was awarded a bursary from the David Canter Memorial Fund, which will enable me to buy a raising stake and a planishing stake. These are used for “raising” vessels, details of that here. Setting up a silversmithing workshop is a very expensive task and I have worked hard to do just that, plowing every penny I have into the necessary tools and equipment and these expensive stakes were yet to be afforded. I am incredibly grateful to the David Canter Memorial Fund for this help, which will have such a beneficial effect on my future work. The stakes should arrive any day now and I cannot wait to get stuck in. 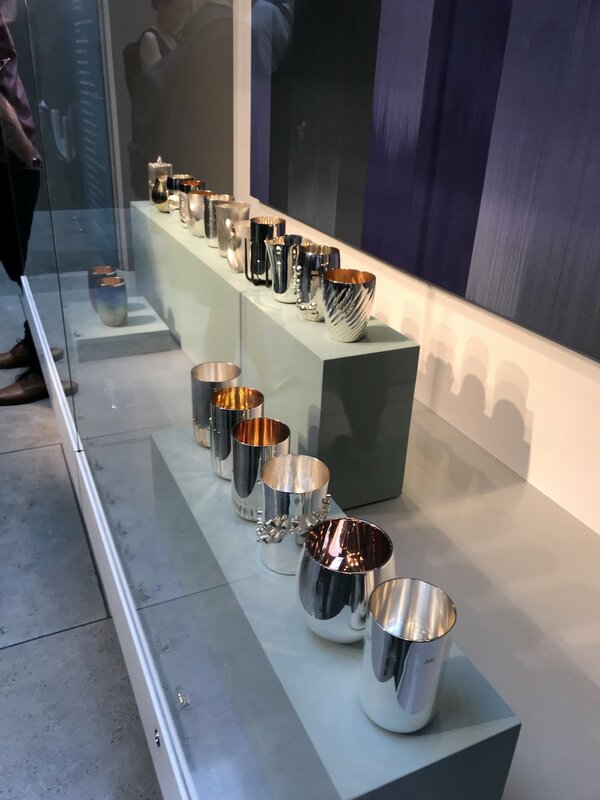 Would you like the opportunity to make a silver beaker, to be used at gin tasting events and displayed at The Goldsmiths’ Centre over summer 2018? 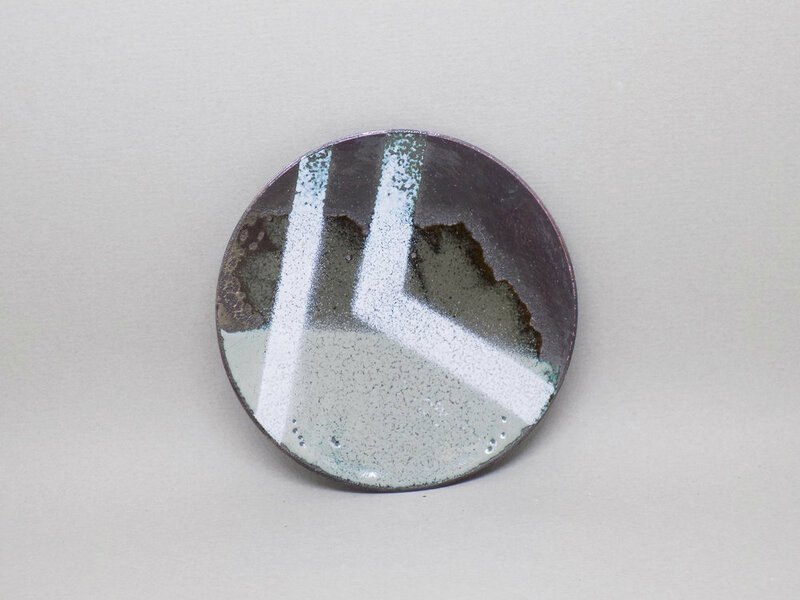 You are one of 25 makers who are being invited to take part in this commissioning project. 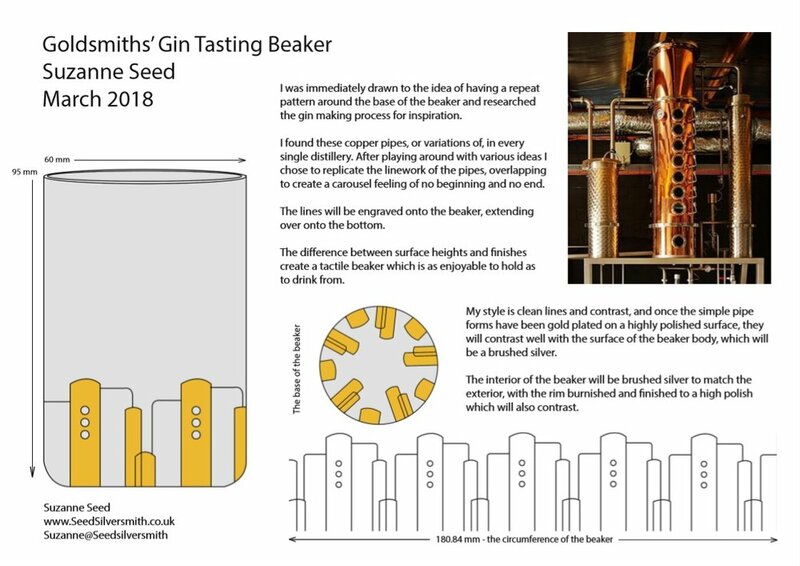 The Goldsmiths' Centre is commissioning the beakers to be displayed in a selling exhibition alongside the touring exhibition Made for the Table (13th July-31st August 2018), and used in gin-tasting events." Of course I would like to! 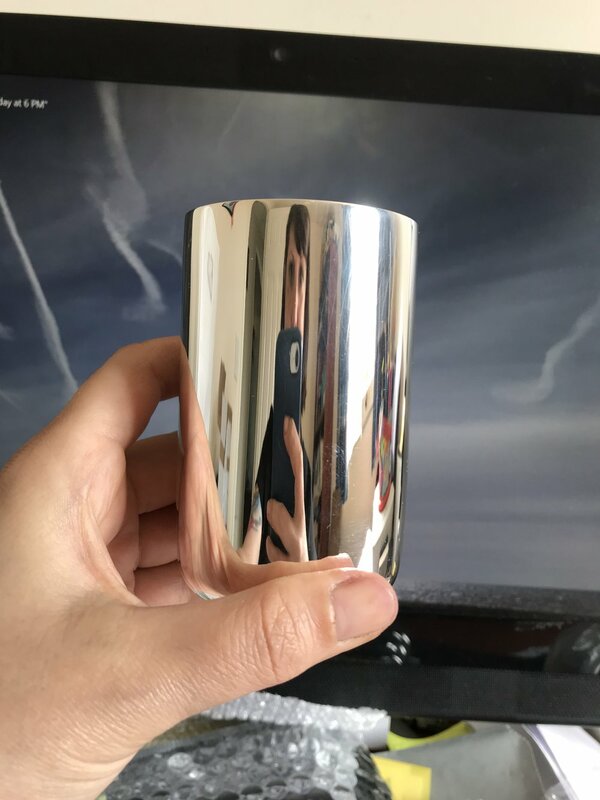 The only criteria we had, aside from it being used for gin tasting, was that we all started off with the same shape and size silver beaker. As I'm used to creating my designs from concept to completion this presented me with a bit of a challenge. But that is my favourite part of commissions, being pushed outside of your comfort zone and being made to look into areas you wouldn't usually consider. 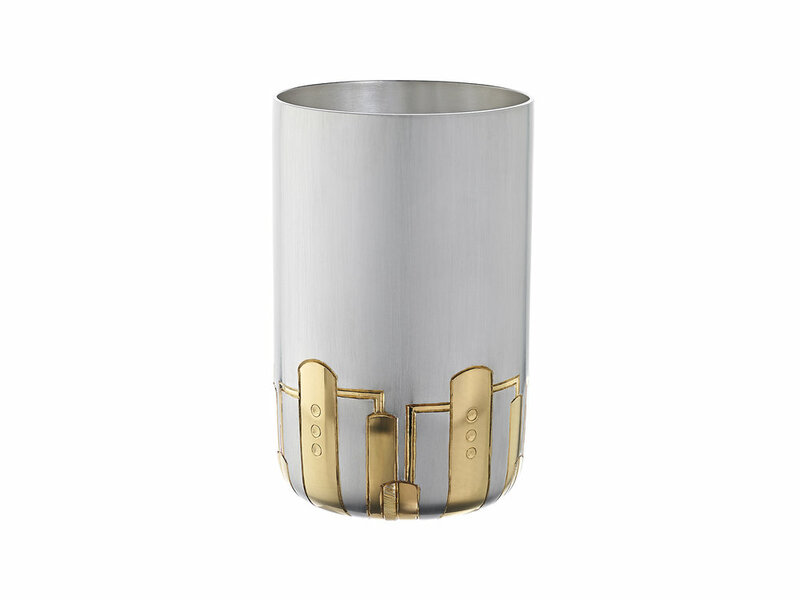 I don't yet have skills such as chasing or engraving so I thought instead of focusing on what I *could* do, I would create a design I was happy with and if it was chosen to be made, I would enlist the help of professionals in those disciplines. Which frustrated me quite a bit in the beginning as I love to be in full control, but eventually I came to terms with it and started to enjoy the experience. A valuable lesson has been learnt - don't let my current skills hinder future designs! My very first thoughts were along the lines of contrast (as with all my work) and some kind of repetitive design running around the base of the beaker, as repetition has featured strongly in previous designs too. I noted down my 'vision' as a starting point. 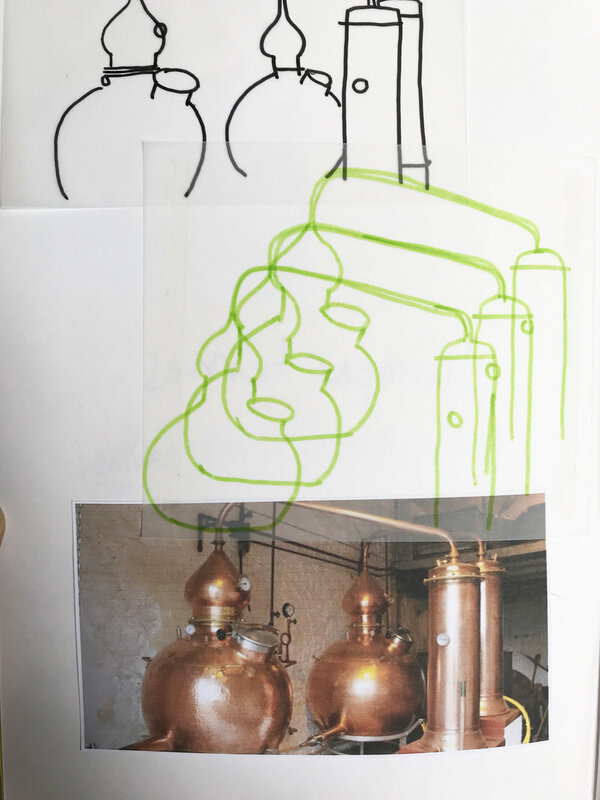 Next I set about research how gin is made, in particular the use of copper stills. I grabbed images of these from Pinterest and started to trace over them, seeing of any of the forms appealed. This is another technique I have used in the past, if an idea doesn't present itself I will trace various lines and forms until something starts to appear. A starting point. These are some of the pages from my sketch book, showing how I explore different ideas. One really stood out for me, so I decided to develop it more. I had initially wanted a black gold plating, but this isn't suitable for items with food use, but once I saw the gold sketch I preferred that anyway. Thankfully! 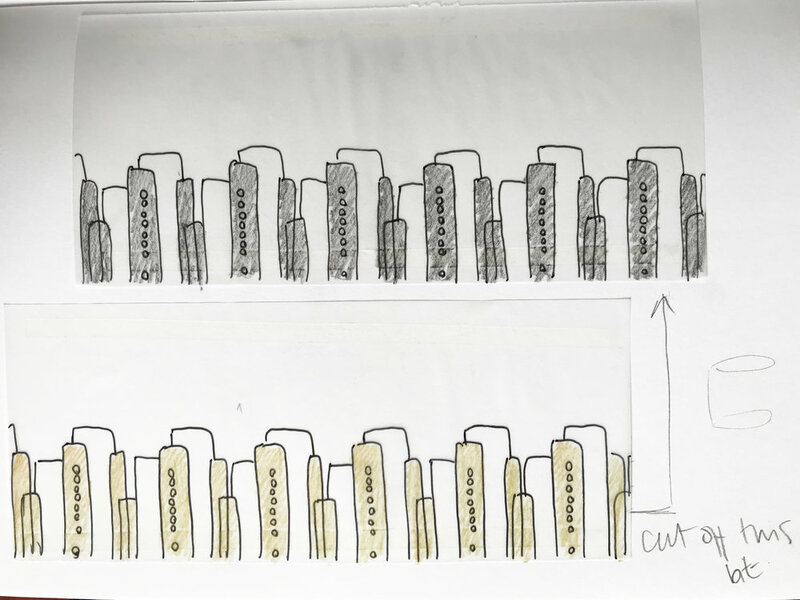 I scanned this sketch and transposed it into Adobe Illustrator, that is were I create all my templates as I can insure lines are straight and repetition is exact. But I could never create the design straight into Illustrator, I need to work through with pen and paper first, and my line drawings are never precise enough so I enjoy a marriage of the two. I had a sudden brainwave to carry the design over on to the bottom of the beaker, which is now my favourite bit. Now I had the design resolved I sent it off to Goldsmiths, and with all applications I make I tried to forget it existed. This is my way of not building my hopes up to avoid disappointment! 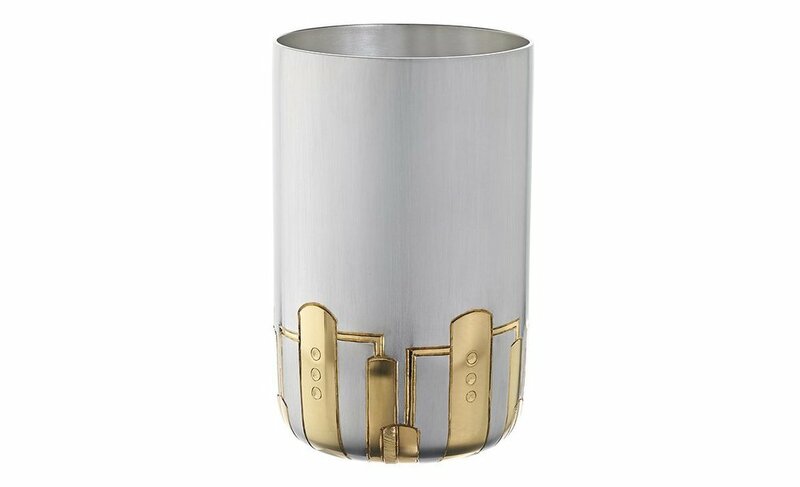 Hurrah, my design was chosen and I was sent a beaker. I spoke to a few different engravers before deciding to use Karen Wallace, who is apprentice to Malcolm Appleby so not only did I know she would be excellent but when we discussed the design on the phone she suggested little touches such as shading the cross over areas to add that little extra. I knew the beaker would be in safe hands after that initial phone call and I had gone from being hesitant and worried I would every find anyone, to calm and confident that my design was in the best hands and with someone who fully understood. 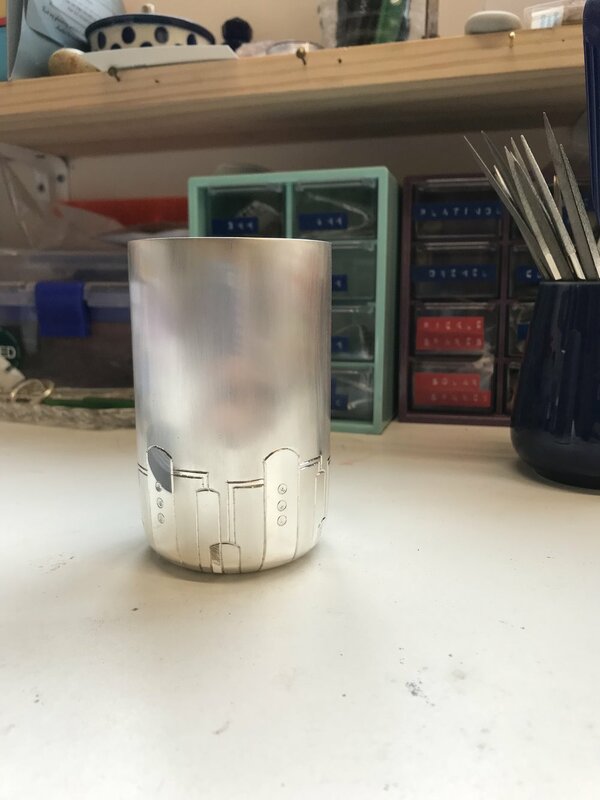 Receiving the silver beaker and checking the design against it, marking it up for height so Karen knew exactly where to engrave up to. Once I received the beaker back from Karen I needed to mat the body then send off to be hallmakred. Once I had the beaker back I blocked that out the main body surface to polish the Still parts up, in prep for the gilding. I wanted those nice and shiny, so they would contrast with the matt silver body of the beaker nicely. Duct tape and a scalpel, and lots of patience, was my friend that day. I discussed the design the Steve Woods, the gilder, as initially I wanted a rose gold to replicate the copper colour of the stills. Steve advised that while that was achievable it was increasing the odds of some slight bleeding. So I went with the usual gold I have and I'm really pleased with it. 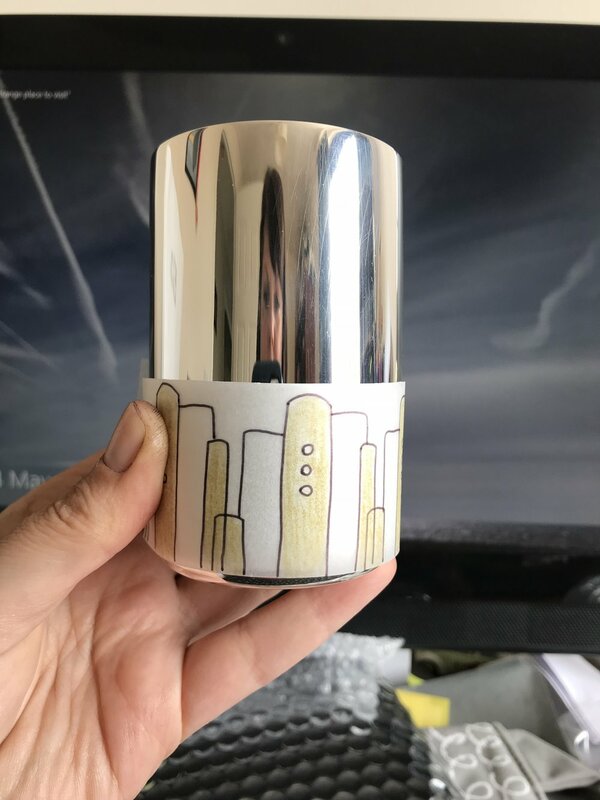 I also debated whether to gild the interior also, as is usual in many drink beakers, but it was suggested that a gilded interior means the eye is drawn to the interior first, rather than the exterior, and I wanted the exterior to get all the attention. Also, gin doesn't tarnish or discolor the silver like wine does, so its not necessary and that helped to make my descidion. 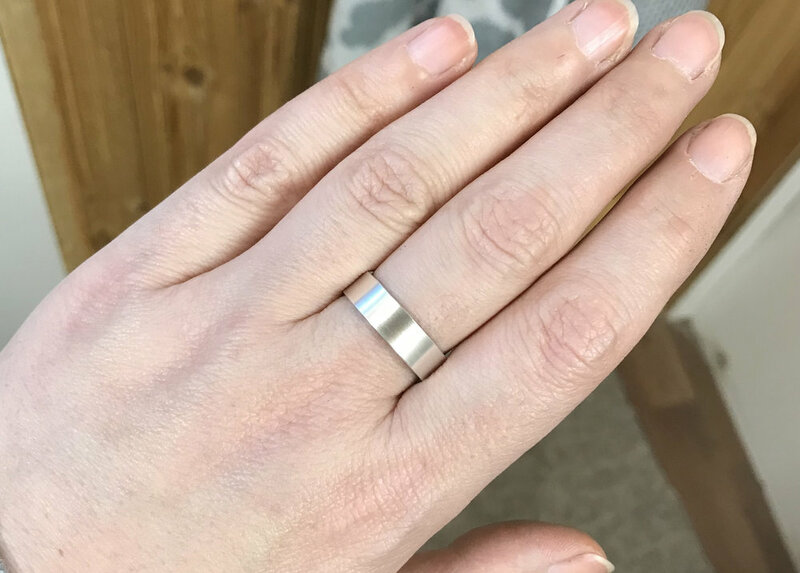 I thought it was about time I wrote a blog to take any mystery out of what a ring lesson actually involves. I appreciate it can be a bit daunting to anyone who has no previous experience so no idea what to expect. Three happy recipients showing off their rings and special goody bags. There are a few different options for the lessons, which can be found here but the processes you use will be the same throughout. If you are unsure of anything, I am always at the end of an email ready to answer your questions, and my mantra is no question is a stupid question. When you book your lesson we agree on a convenient date, and I will send you a little information on what to expect, what to wear, and where to come. Lessons are usually held on Saturdays, Sundays and Mondays but other days can be arranged. My private studio workshop, where you will make your silver ring. Although you probably won't get dirty I always recommend not wearing your best clothes. And open shoes are a no no too, you will be working with heat and tools so best keep those toes covered up. Finally, if you have long hair, you will need to tie it up. I suggest bringing a notepad and pen for you to take notes, however most people prefer to take photographs. If, after you leave, you would like notes of the processes you have learnt, I am happy to email those to you. 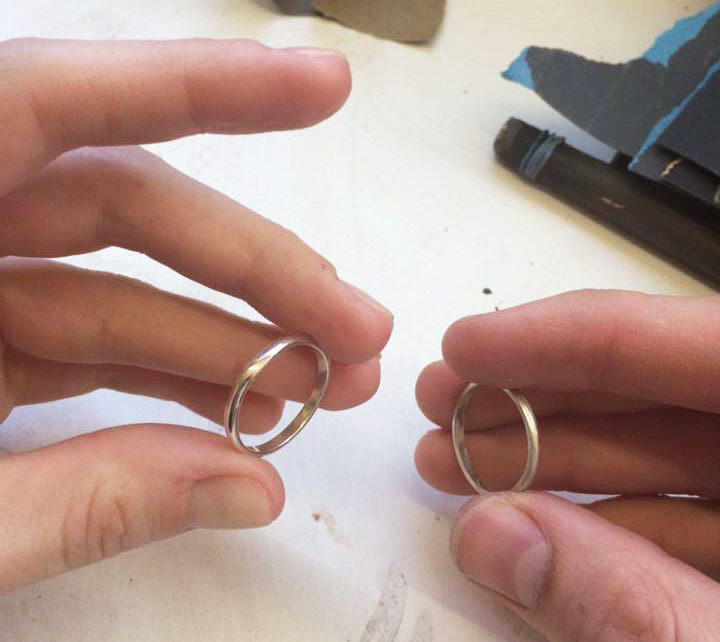 On the day you will learn how to make a silver ring from scratch, gaining a basic understanding of silversmithing tools and processes. These processes including piercing (sawing/cutting), texturing, annealing (heating), forming, soldering, filing and polishing. Don’t worry if this sounds daunting, I demonstrate every step and ensure you are comfortable before working through it on your own and I can guarantee you will be able to manage all steps by the end of the session. However, if there are any steps you would prefer not to do, just let me know and I can do them for you. The lesson is informal with the pace being directed by you - we go as fast or as slow as you feel comfortable with. You will use the following tools - and it doesn't matter if you've never held a tool before in your life, you will be confident with each tool by the end of the session. Pickle – acid, helps to remove any oxidisation created by the flames and return the surface back to its original state. I hasten to add that even though the pickle is a very diluted acid, so not harmful to touch, I do this bit so you do not have to go near it. Pumice – Gets all the pickle off. Sheet of water, flows off, means fully clean. 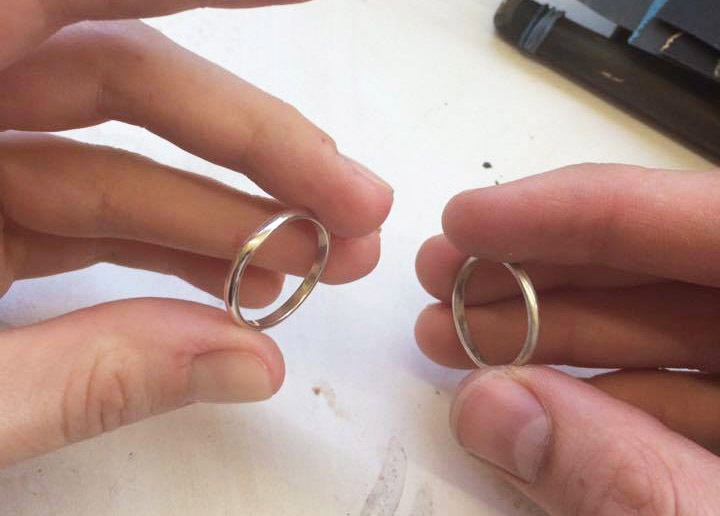 At the end of the session your ring gets polished (if that is your chosen finish), a final clean up then its ready for you to wear! You also get a little black bag containing a ring box, a special anti-tarnish cleaning cloth for silver, and a how to care for your silver card. And finally, and most importantly, here is some feedback from people who have had a private ring lesson. "I love my ring, and wear it all the time. " "For me, the lesson was absolutely perfect. I found you extremely easy to talk to. You explained each process really well, and it was easy to ask you questions." "The communication before the session was excellent, we got to visit the workshop prior to the day and knew exactly what to expect." "The pace and level was perfect for us both, time was taken to explain exactly what to do and had some great demonstrations." "We felt very supported and encouraged to answer questions, everything was explained perfectly to our needs." "We had a great time, as once we were shown how to do it, Suzanne allowed us make them independently (although she was there to support and help out when needed) - which we really liked."